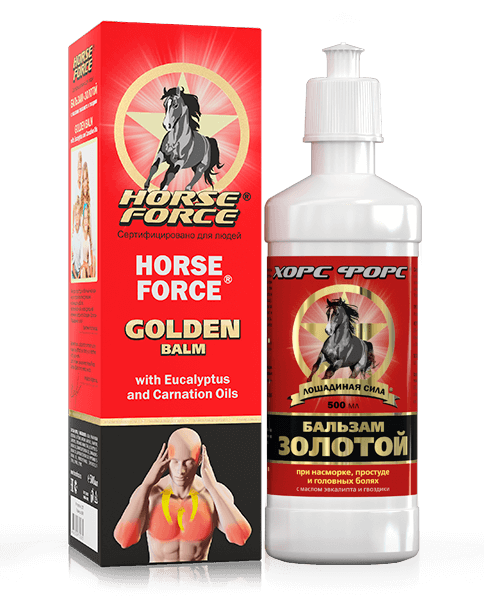 Horse force "Golden balm" with Eucalyptus Oil — Horse Force. Sometimes a cold or a runny nose don’t allow you to realize your plans. So you need a treatment to get rid of all the symptoms. We recommend you to have Horse Force Golden balm in your medicine box, which is really a universal treatment for all family! Apply to dry clean skin of breast, back, feet or other areas of discomfort. May be covered with a bandage or warm clothes.